It's Springtime at Cafe Ohlone! huyyi tiwši warép! This is how we say it’s Springtime in Chochenyo language, the first language of the East Bay. However, this phrase means something more than just the traditional name for the season; it translates to “the world has begun to flower.” We are celebrating at Cafe Ohlone. We’ve been up regularly in the East Bay hills gathering rooreh (Indian lettuce) with and eating it in a variety of ways: with roasted bay nut truffles, dried wild strawberries, and sometimes with a simple salt crystal — a traditional bite during early Spring, told to us from archives recorded in the 1930s. It feels good to see these flavors enjoyed by our people again. Fiddleheads, the young growth of fern, is back on the menu for a short time. Looking like a spiral, fiddleheads are delicious, crunchy, and have a great asparagus-like taste. We flash-fry fiddleheads with walnut oil, East Bay salt, and gathered bay laurel. We’re seeing Indian onions on the menu for the first time in a while, too. Our native onions are delicate and nuanced — slightly like a scallion, but with a taste that you will never forget. We sauté these and offer a bite when they are available. On the subject of seasonal foods, our rooreh (Indian lettuce) was on the front page of the San Francisco Chronicle’s food section! We are grateful for the review, written by the Chronicle’s new food critic, Soleil Ho, who recognizes that we are serving more than food at Cafe Ohlone. It is a reminder of how far we’ve come, to see Ohlone cuisine on the front page of the Chronicle’s food section — 20 years ago such a thing would’ve been unthinkable. As with any achievement, we acknowledge that we can do this work only because of those who came before us— we want to make them proud every day. 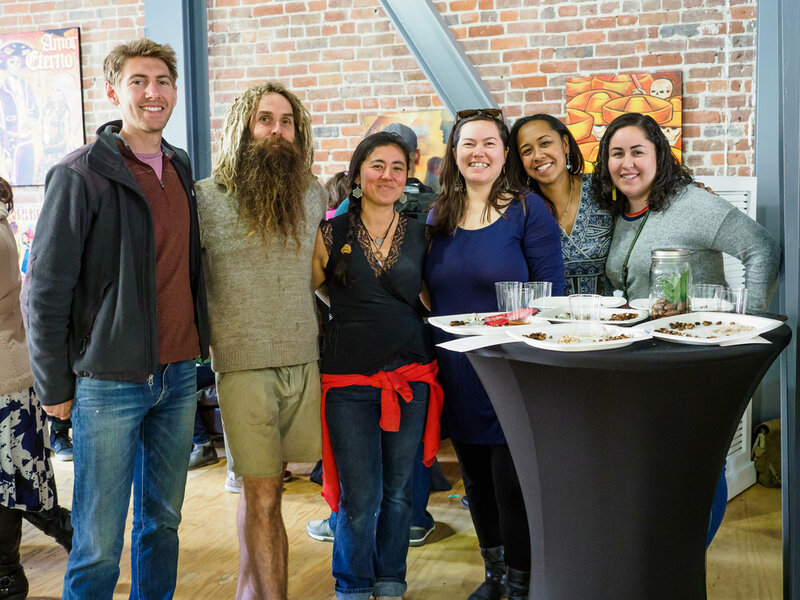 The Muwekma Ohlone Tribe celebrated our first tribal meal at Cafe Ohlone on April 12! More than 30 tribal members from several different lineages came together as we ate a traditional dinner of our delicious Ohlone foods. We worked to strengthen our language over dinner, sang in Chochenyo, and played the most competitive walnut dice tournaments we’ve ever had at Cafe Ohlone. It feels good to see our people so empowered; as we drive past Berkeley’s new “Ohlone Territory”signs and step into Cafe Ohlone, there is a feeling of healing and of hopefulness. This is decolonization in action; let’s keep this positive change moving forward. Moving away from Berkeley, we are proud to be a part of a very special event on April 27: the First Foods Dinner, offered by the Cache Creek Conservancy as part of their educational program to help bridge cultural understanding and knowledge about California’s tribes and their histories. 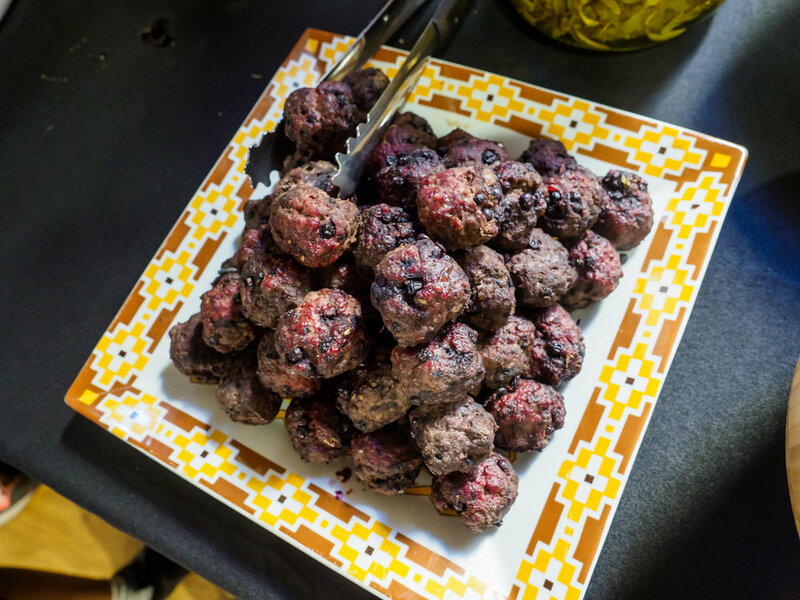 In addition to an amazing meal featuring ingredients such as venison and salmon prepared using traditional methods and recipes, we will be bringing traditional Native American games for dinner guests to experience. Tickets are available here. Finally, we are proud to introduce the art that will represent mak-‘amham and Cafe Ohlone! This piece, originally designed on a pizza box, was created by Patricia Wakida (@wasabipress) — an artist and cultural activist with whom we’ve long been friends and who we respect greatly. This piece represents our culture: the valley oak acorn is prevalent throughout the East Bay and is the most common acorn we eat nowadays. The pattern inside the acorn comes from an Ohlone basket woven generations ago that is still beloved today. The crow and the quail, two native birds, are the favorite birds of co-founders Vincent Medina and Louis Trevino (respectively) — sometimes their personalities can be like those birds too! Expect to see this logo, and the more detailed original at Cafe Ohlone, as we move forward. We express our deep gratitude to Patricia for her thoughtful work on this art and for helping our vision become a reality. That’s it for now! ‘ammamak rooket — we will eat together soon. Our redwood table, specially constructed from a fallen redwood nearby traditional family villages in the Oakland hills, is now at Cafe Ohlone! We are proud to welcome this beautiful piece into the space, further adding to our vision of creating a space full of intention and traditional aesthetics. Already, this table has had stories, traditional gaming, song, prayer and, of course, lots of Ohlone food centered around it. 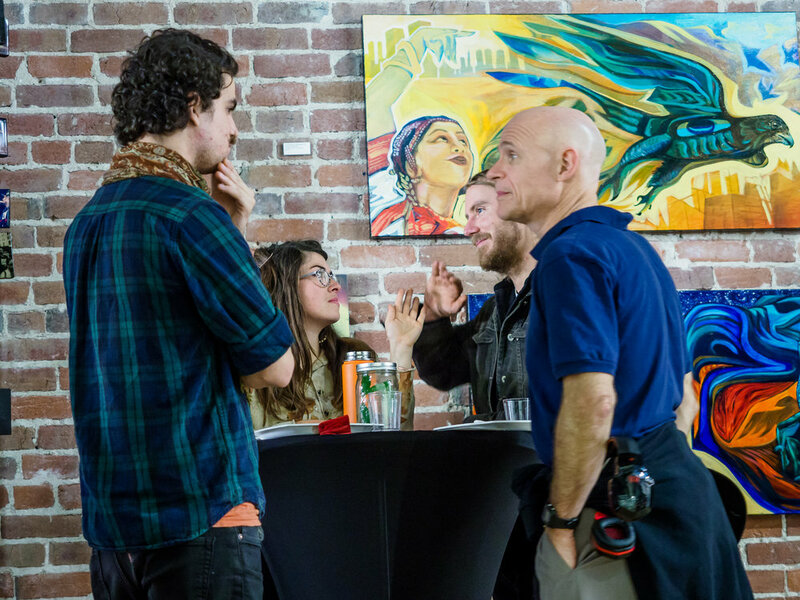 We want the meaningful discussions and knowledge shared around this table to move into the world around us. Cafe Ohlone will be closed Thursday January 3, 2019; however, our January schedule will be very robust. 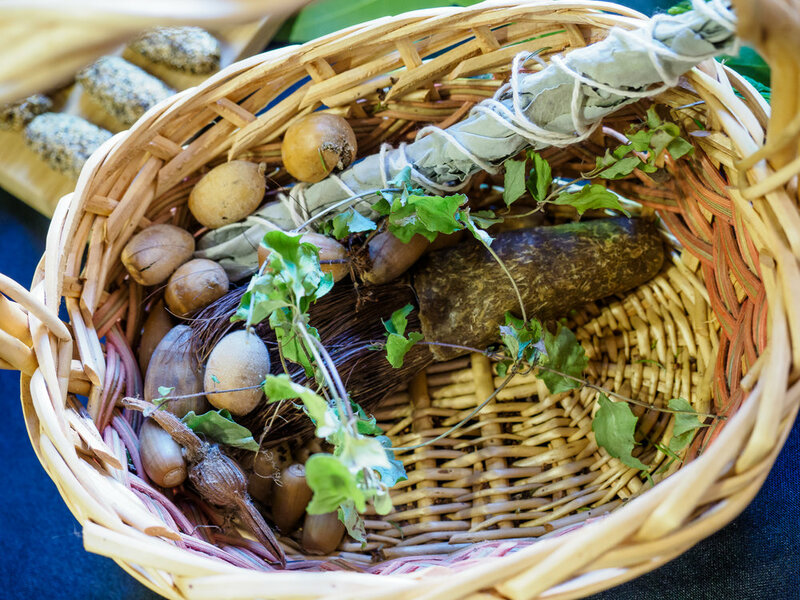 With consistent events on Tuesdays, Thursdays and alternating Saturdays, we now offer a variety of ways to engage, discuss and interact with those who want to learn about our living culture and experience traditional Ohlone cuisine. On Tuesday January 8, we will introduce tawwa-sii Tuesdays, our regular evening tea hour at Cafe Ohlone. tawwa-sii means tea in the Chochenyo language. We will have a tea hour every Tuesday evening from 5:30 to 6:30 pm. We envision lively, fun, short bursts of energy on these evenings; Cafe Ohlone will offer seasonal East Bay gathered Native teas, traditional small bites and contemporary Indigenous music to end your day. As with any event at Cafe Ohlone, we will keep the hour focused on living Ohlone culture and identity. 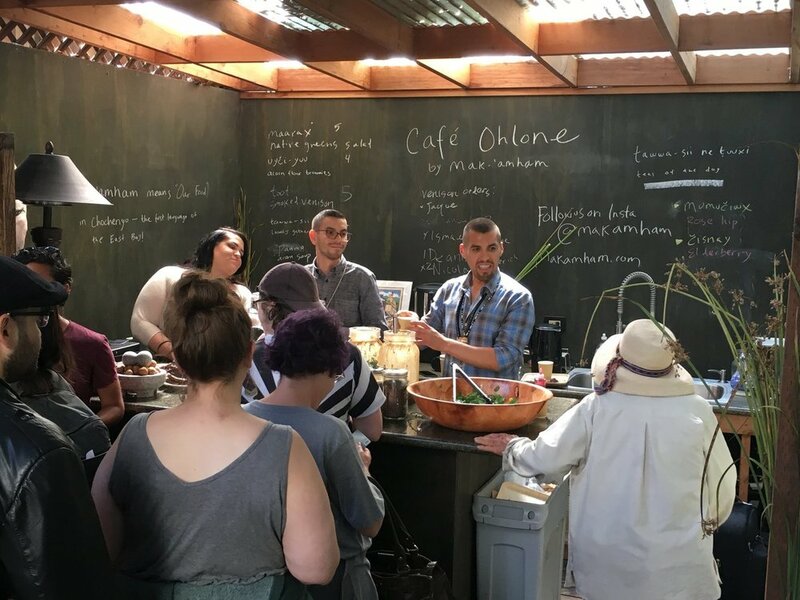 Our series of evening meals and discussions at Cafe Ohlone includes boundary-breaking discussions with cultural revival leaders in our community and an elegant, locally gathered dinner of all pre-contact Ohlone foods and Native teas from the East Bay. Sit under the twinkling lights while surrounded by Native plants, Chochenyo language and contemporary Indigenous music. 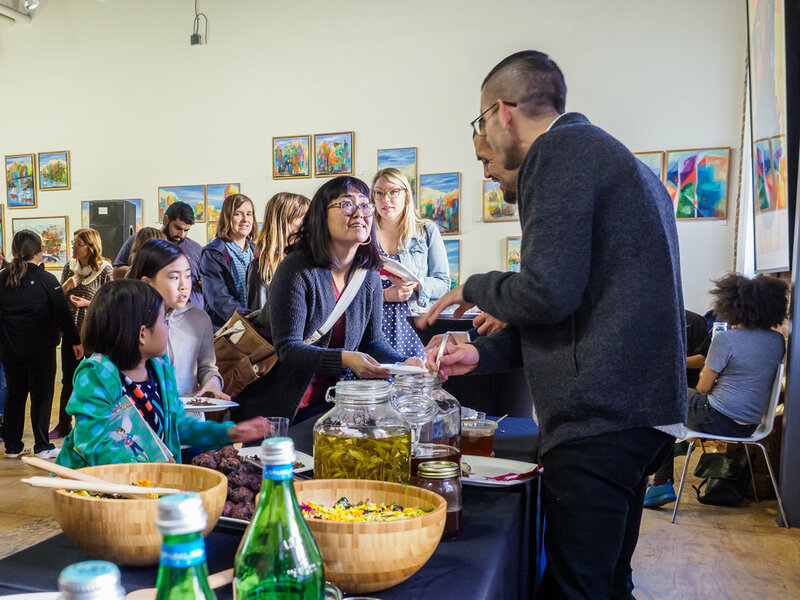 Wrap yourself in a blanket as you sip locally gathered Native teas while listening to stories and powerful discussion and learn directly from the first people of the East Bay. Tickets go on sale a week or so before the date. Check our website for a link to buy tickets for an intimate evening of rooted foods and rich, meaningful dialogue that will work toward a decolonial future here in the East Bay. Looking for the perfect gift? We offer gift certificates! We call these miiram, which means “gift” in the Rumsen Ohlone language. Click here for more information. We are honored to be the subject of a recent PBS show, Tending Nature and to be featured in recent articles in San Francisco Magazine and Bon Appetit! Learn about the work we are doing to reclaim Ohlone cuisine through this video produced by the Cultural Conservancy. We are proud to have been a part of this powerful day in Coast Miwok land in Marin telling our story of resilience, hope + renewal of our food ways. We thank the Cultural Conservancy + Indian Valley Farm for organizing such a memorable event. makkin 'alšip-mak. We are grateful. On December 17, 2017 something incredible happened in xučyun (Old Oakland) at E14 Gallery. 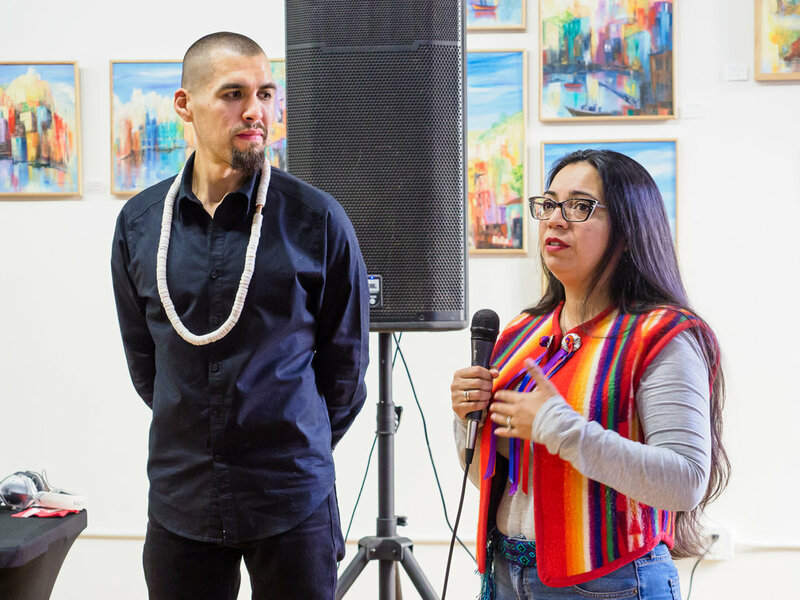 We brought a feast composed entirely of Ohlone foods, made with pre-contact, traditional ingredients to this powerful gallery space and shared our story of Ohlone persistence, continuity, struggle, and beauty. The space, an old brick building built with money from the Gold Rush — money that was obtained in the 1800s doing the worst types of injustices against Indian people — has been transformed by the staff of E14 Gallery, especially the powerful work of Vivana Rodriguez, a strong Chicana leader who strives to have the voices of communities of color promoted and heard. Her gracious opening of the space to mak-'amham was a natural fit. The East Bay is our home; the home of my community, the Chochenyo Ohlone people. In spite of all the hardships and challenges our people have faced since the start of Euro-American colonization, we have persisted. No generation of my family has been born out of this ancient, beloved place that we descend from — stretching back into our Creation time. We still live and thrive here to this day. Of course, this did not come without a heavy price our people had to pay, challenges we still face with the ongoing forces of colonization that attempt to break us from our home. Yet, we persist, and we will unquestionably never leave our hiswi-warep, our birth place. Colonization also attempted to suppress every aspect of our Ohlone culture; from language, to basketry, from religion, to even our very names. Colonization also attempted to break us from our cuisine, our foods that are rooted in the homeland. Our ancestors had undeniable strength, and refused to surrender the things they cared the most about — that is what makes revival of these old ways possible. Louis, his community from the Carmel Valley, and myself work hard — along with our elders and members of our communities to bring these old ways back into existence. We resist the theft of land and suppression of our culture by finding ways to honor our people from before, strengthen our contemporary identities, as well as ensuring future generations will not have to work quite as hard to revive, so that these meaningful cultural ways can continue as they are intended to. We are seeing this come true, as young people grow up with Chochenyo and Rumsen Ohlone languages in their lives, Ohlone foods on dinner tables again, story come back home, our values revived, and our connection to homeland strengthened. This is a collective effort, it's not just us — we are voices in a chorus of many. Our Creator and our ancestors are the guiding forces. Part of this effort also means that we have the courage to speak out, loudly, to remind people of our continued existence. Sometimes this can be difficult because we have seen what happens when Indian people speak out; we are often belittled and told our truths do not matter by larger society. Echoes of people angrily and dismissively telling us it's the past, and get over it are common, even in the ultra-progressive bubble of the Bay Area. It's not the past, and we are not over it. Far from it. Healing takes time, and the efforts to destroy us, while not successful, left tangible pain that is evident in all aspects of our world. With our ancestors as a model of survival, we still persist. We find the courage to speak out and remind people that this is Ohlone land, we have never ceded or given up this place. We have never left. We never will. On December 17th we did just that. We decolonized a very colonial space — bringing the power of Ohlone culture front and center; creating a space full of Ohlone language, Ohlone stories — and, of course, Ohlone cuisine. A five-course meal of small, nourishing bites, all paired with Native teas gathered in our home. Rose hip tea served with popped amaranth seeds, soft boiled quail eggs, and piñon nuts; white sage tea with Native greens, and purslane in homage to my great-grandma, Mary Archuleta, who loved that plant dearly and was the last generation of my intermediate family to gather traditionally before the contemporary revival. We made blackberry and bay laurel soda served with acorn flour flatbread, the acorn from saklan, a family tribal area east of the Oakland Hills; elderberry cider gathered from Louis' Rumsen homeland in the Carmel Valley served with savory venison meatballs full of juicy huckleberries and crushed yerba buena, also from saklan, where many of my direct ancestors are from. For dessert we shared freshly gathered yerba buena tea with acorn brownies which we make to introduce acorn, a beloved traditional food, to our young people for the first time, and sweet pinole seed cakes shaped in the same form as described to us from old notes recorded in the 1930s. All of the food served had intention and rootedness in place. We spoke of our contemporary identities, and the struggles our people face today. It was boisterous, loud, unabashed, and uniquely Ohlone. Each time we described a course, it had a story and a proper name in our language. We are grateful. Grateful for Vivana Rodriguez from E14 Gallery for opening space for us to do this. Grateful for Alicia Adams (Maidu/Chemehuevi) for the logistical and emotional support, grateful for Jayden Lim (Pomo) for bringing Native house music to our event through DJ'ing. Grateful for everyone who showed up, ate, listened and understood that mak-'amham is centered on justice for our people. We feel victorious, and we know there will be more events like this. Food is connected to every other aspect of our culture; as we eat these ancient foods, woven together with Ohlone language and story, all while being present in our homeland we are closer to those old ways, and our ancestors, that are cherished and wholeheartedly loved. We bring honor to our people and strengthen our collective identities. Not merely of the past, we are people of the present — of the 21st century. We will be here tomorrow, too. In Chochenyo language, the oldest language of the inner East Bay, we say holše mak-nuunu our story is beautiful, ṭuyye mak-muwekma our people are strong, 'ayye makiš haššemak horše mak-muwekma hemmen ṭuuxi and we make things better for our people everyday. makkin 'ammamak 'oyyo rooket, we will eat again soon. 'alšip-mak (we are grateful) to Scott Braley for taking these photographs and sharing them with us. Scott has long worked with Native communities to document significant community events. We cooked šaakani (duck) this week, delicious, savory duck breast roasted until the skin was crispy. As the duck was roasting, sokkoti (bay laurel leaves) were placed under its skin so that the bay laurel oil flavored the meat with its spicy and peppery flavor. The bay laurel was gathered with gratitude in the tribal area of saklan, the same area my ancestors are from. saklan is just east of the Oakland hills, and close to where I was born and grew up. All my Indian family is from around this area, most of us were born here, grew up here and still live close. As the duck was roasting with the sokkoti leaves, I boiled down some local berries – wild strawberries and more bay laurel to compliment the duck, and blackberries with yerba buena from Louis’ homeland in the Carmel Valley. It was meaningful to eat these same flavors our people ate before, with the ingredients maybe even gathered from the very same trees and woodlands our ancestors gathered from and cherished. It was a meal that nurtured us in every way. The next day, talking to a friend of ours named Nadja, I told her how good the duck came out, and how we love to taste the flavors of home. As I was talking I started to tell a story – one that reminded me of a time that this delicious food was not available to my family, even though it should have been. This story happened before I was born, even before my father or grandfather was born. It is a story recorded in our old documentation recorded by John Harrington, a linguist from Washington, DC. Mr. Harrington interviewed an elderly Indian woman named Susanna Nichols here in the East Bay in 1930, over in Niles. Susanna is the sister of my great-great-great grandmother, Avelina Cornates. People in my family still remember Susanna’s name even today, especially the elders. Susanna remembers that when whites first came into the East Bay, they ran Indian people off the land. Susanna’s family, witnessing this injustice, went to Mr. Manyan, the first police officer in Newark. Mr. Manyan gave Susanna’s family a paper granting permission to put nets wherever they wanted to hunt ducks, but first told Susanna’s grandmother it’s your land. As I told that story, I thought about how fortunate we are to eat these delicious Ohlone foods today, but also thought about the times in our history we could not eat like this. And this is of no fault of our own, but because people prevented and restricted us from eating our heritage foods as a result of colonization and our lands being stolen. Today, we can eat enjoy Ohlone cuisine again and remember that generations of people have fought for our foods and recognized their importance. Of course, we still have restrictions and difficulties attaining these traditional ingredients and game, but it is encouraging to know that people in our community have always done what they could to keep these foods in our world. I think about how difficult it must have been to have to ask for permission, in ones’ own home, to hunt for the same foods that countless generations have before. I’m grateful for Susanna’s family for having the foresight and courage to take this act. And Mr. Manyan’s response is spot on. As we eat, we are reminded of our ancestors and their sacrifices. We are reminded of home and these plants that are gathered in our birthplaces. We are reminded of the truth – the need to stay fed with good food, and stay woke against injustice everywhere facing our people and our food. When the white strangers came they ran people off the land, would not let them shoot ducks, and my family went to see Mr. Manyan and he wrote out a paper giving us permission to put duck nets where we wanted, “it’s your land” he would tell my grandma.